Materials: 23.5K Gold Leaf with Quartz and Crushed Lapis. The Flower of Life is the most recognized symbol of all sacred geometry. 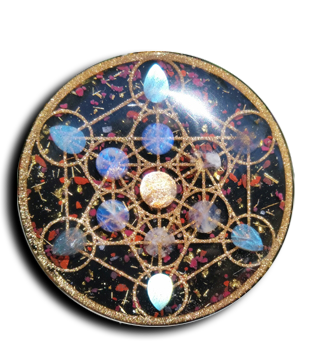 This design captures the flowering and expansive energy of universal hologram to aid in opening the mind (3rd eye) to the unlimited possibilities contained within the soul’s journey around the Tree of Life.The Tesla Coil design aids in the circulation of Chi/Life energy through the body. It is a winding of metal wire that gives a boost to every pendant it is used in. It is commonly found on the backside of many pendant and though it is not a vital component, it is helpful and beautiful.